It's late Monday night. 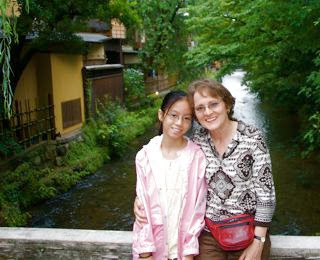 Yumiko and I had a TRULY wonderful time in Takayama and Kyoto. I will be back with a fresh brain tomorrow (not likely) but at least some fun stories to tell. In the meantime here's a picture of us in Kyoto at one place where "Memoirs of a Geisha" was filmed by Steven Spielberg.